I have always been a bookworm. As a young girl I was sometimes caught reading at night under the bedclothes and my flashlight and book were taken away from me. It is the same with my oldest boy. He is fourteen years old and a real audio book fan, my youngest has just started reading and is in the process of finding out what books are all about. 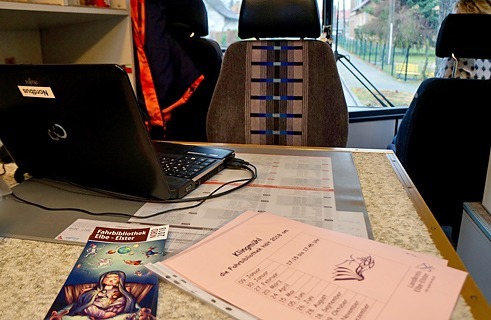 The mobile library is important to all of us, because our family lives in a small village in the Brandenburg district of Elbe-Elster called Klingmühl. It has 120 residents. We all feel very much at home here. It is paradise pure with woods, meadows, fields and a nice village community – but of course no library. There are libraries in the bigger towns of the region, but getting there is a question of time. In 2005, I began as a trained reading assistant at the Kreismedienzentrum (district media centre) in Herzberg, 50 kilometres away. There I found out about the mobile library and managed to persuade it to come to Klingmühl. Now the Library Bus stops every three weeks on the village square. A lot of the people from the village use the Library Bus, it has become a permanent fixture. We mark on our calendars when the bus is coming – that is then our library day. The Library Bus stops every three weeks. | Photo (detail): © Sandra Stephan In the summer, the children stand around, waiting patiently for the Library Bus to arrive, it becomes the focal point of village life. What strikes you first is the outside of the bus, it is big, blue with lots of colourful images. The inside is fitted with carpet and that makes it really cosy. When you get on the bus, you feel as if you have walked into a living room. First, you have to make your way to the two ladies sitting on the driver’s side of the bus, because that is where we have to return the books we took out the last time. 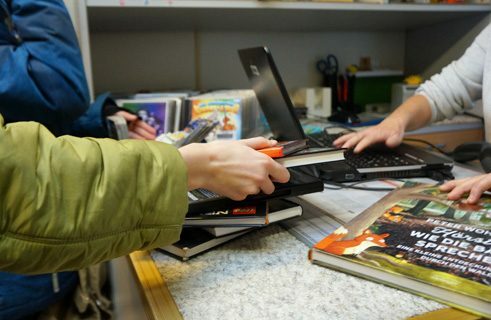 Returning the books to the "library ladies" | Photo (detail): © Sandra Stephan After that, we browse round to choose the books or media that we want to borrow this time. 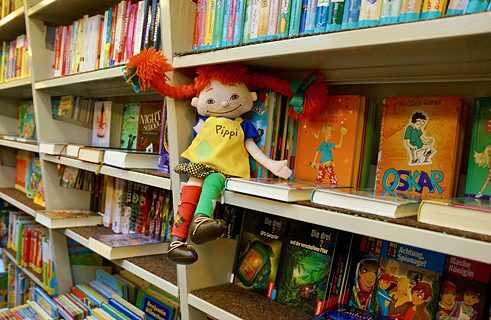 The interior is not very big, but everything has been cleverly arranged: there is an extra bookshelf for children, one for teenagers, shelves for non-fiction and fiction. Just like in any conventional library, it is all so wonderfully organised. Of course, the Library Bus also has games, DVDs and CDs that can also be taken out. At the back of the bus there are cube seats, as sometimes the little ones often like to look at a book right there. The books I borrow are all very different. Quite often I spend a lot of time looking what there is. And then I make my choice. At the moment, I am more into reading social novels and novels with a historical background. The Library Bus is well organised: an extra bookshelf for children. | Photo (detail): © Sandra Stephan Sometimes we have to order books in advance, because the mobile library obviously cannot transport all the books and media it has in its collection. It does, however, have the right contacts and connections to acquire everything we need. The Library Bus starts its tour from the Herzberg District Media Centre and stops for twenty or thirty minutes at various places, depending on the location. It strictly adheres to the timetable, because it is eagerly awaited in the next village. It always arrives in Klingmühl late in the afternoon, in the neighbouring village of Sallgast it opens its doors at noon right in front of the elementary school. No delay: the bus strictly adheres to the timetable. | Photo (detail): © Sandra Stephan We have even followed the bus to the next village or the one after that, because we missed it in our village. We know where the following stops are and it is on the road until the evening. Of course, I could also use the online library of the mobile library and borrow digital media, but I like to feel the books in my hands, I like turning the pages, and even the cover of the book is often where the book starts for me. Printed books will always be of importance to me, and I try to convey that to the next generation. When I take trendy books to the children in the Sallgast primary school reading club, they are really bowled over by them. Cube seats: the kids often like to look at a book right there. | Photo (detail): © Sandra Stephan In my view, the Library Bus will always have a future. Especially in rural areas, many people would never ever think of going to a library, because they are all simply too far away. This might even lead to the path to the library as an institution being closed to children right from the start. The Library Bus is accessible to anybody who wants to use it. I just hope that mobile libraries will continue to receive financial support and be able to roam through the countryside, plying their valuable trade. 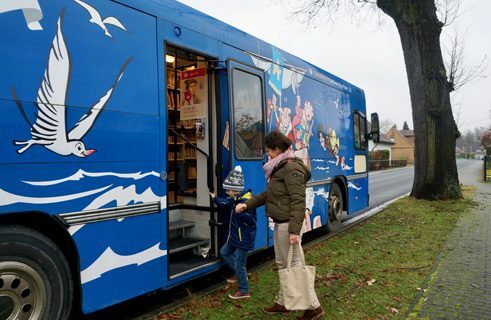 The mobile library in the district of Elbe-Elster in Brandenburg has two Library Buses at its disposal that tour the area on a strict schedule, stopping at 145 locations once every three weeks. 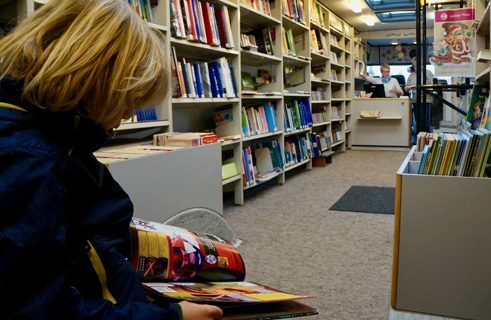 Every year about 21,000 visitors use the mobile library, 80,000 books and media are borrowed. In addition to the physical media, the customers of the mobile library can also avail themselves of the library’s range of digital products. Sandra Stephan is a banking administrator and lives with her family in Klingmühl in the district of Elbe-Elster. She also shares her enthusiasm for books with others – she works once a week in a kindergarten and elementary school as a voluntary reading assistant. Copyright: Text: Goethe-Institut, Sandra Stephan. This work is licensed under a Creative Commons Attribution – Share Alike 3.0 Germany license.